“This is not a documentary. It is a performance. Yet each of his performances was in itself a story of this man’s life”. The above statement appears at the beginning of The Lenny Bruce Performance Film, a 1966 movie covering Lenny Bruce’s next-to-last live appearance (he would be dead within the year). 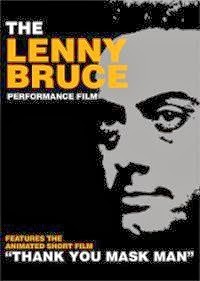 Recorded in San Francisco in August of 1965, The Lenny Bruce Performance Film doesn’t exactly feature its title subject at the top of his game, yet does provide viewers with a rare opportunity to see this highly intelligent, oft-tormented comedian doing what he did best. By the time The Lenny Bruce Performance Film was made, Bruce had been arrested three times on obscenity charges, stemming from his use of “colorful” language on-stage. In fact, Bruce had become so preoccupied with his legal battles (which had all but bankrupt him) that he dedicates the majority of this show to discussing his various court cases, occasionally going so far as to read from the manuscript of his trial in New York. To see this once-great comedian so obsessed with his legal troubles is, to put it mildly, kinda sad, yet even when reciting courtroom mumbo-jumbo, Bruce does so with enough wit and insight to make the entire ordeal worthwhile (What I found most interesting was that he reserved his most pointed observations not for the authorities who arrested him, but for his own defense team, who he felt bungled his case so badly that the court had no choice but to find him guilty). Along with the legal discussion, Bruce also manages to slip in a few funny remarks, covering such topics as Alaska, Lyndon Johnson, and Las Vegas burlesque. Much like Bob Fosse’s 1974 award-winning movie, Lenny, The Lenny Bruce Performance Film reminds us just how far ahead of his time this brilliant comedian was.